New tangler Kate McIlreavy lives in the small town of Glengormley in County Antrim, near Belfast, Northern Ireland. Sláinte is her first tangle on the site and it is a traditional Irish word for the toast “Cheers” or “Your health”. Want to know how it’s pronounced? “Slon-tuh” would be my approximation from listening to it here on a pronunciation dictionary. “I thought about some of the things Ireland is famous for. The Giant’s Causeway, the Shamrock and St Patrick. 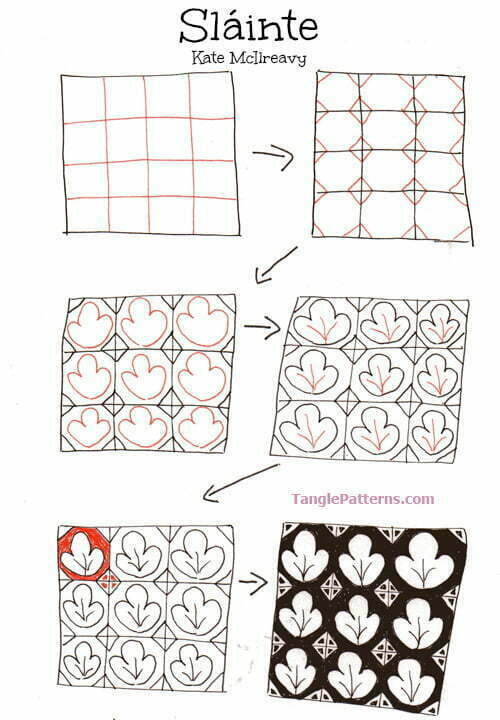 I have used these shapes in my tangle. The shape of the rocks at the Causeway, the shamrock inside and a small cross in between to represent St. Patrick,” Kate writes about the inspiration for her tangle. Most everyone is familiar with the shamrock and St. Patrick, but The Giant’s Causeway was unknown to me. It is said to be the most popular tourist attraction in Northern Ireland. There are photos of this amazing black basalt formation and more about the legend surrounding it on Wikipedia on the link above. Be sure to scroll down the Wikipedia page for more photos, and click on them all to see larger versions. Returning to our regular program … in my example of Sláinte, I altered Kate’s Step 3 to alternately reverse the “shamrock” shape in keeping with the “no right side up/can be viewed from all 4 sides” aspects of tangles. Here are Kate’s step-by-steps instructions for drawing her tangle, Sláinte. Cheers! And thanks, Kate. Check out the tag katem for more of Kate’s patterns on TanglePatterns.com. Many thanks Kate for sharing your lovely design Slainte, it will be a joy to work. I love this one. It reminds me of a counterpane, and also some stained glass in Paris. Well done! Kate, thank you so much for sharing Slainte. I recently returned from a vacation in Ireland. It was an amazing trip and I have wonderful memories of your beautiful country (and many inspirations for tangles). We did visit the Giants Causeway, it was one of the highlights of my trip. I can’t wait to try this tangle. It will definitely have a special meaning for me! This is very beautiful pattern, it is elegant and charming, thank you Kate! Thanks so much for sharing the design and your story. I hope to visit Ireland someday. Some of my family comes from there…It would be so much fun! Hi Monica, where are you from? The fair was great , but the Zentangle stand was fab. It is a addictive thing to do and sooooo relaxing. Lovely tangle Kate and such a lovely back story. What a beautiful design, Kate! I used it when I tangled my daughter’s name — click my name (above) to see it!